Synthetic resins in form of liquid-applied coatings are used variously in many industrial branches. Basically we distinguish between the protection of occasionally and permanently stressed components. 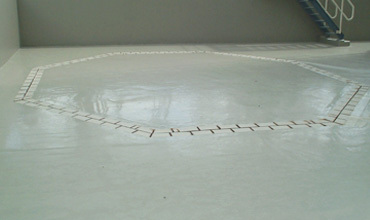 For the first case, so-called floor coatings are applied with the following main properties: high abrasion resistance, jointless surface, crack-bridging ablility, slip-resistant or smooth surface, electrically insulating or derivation ability, chemical resistance, attractive optic, weather resistance or easy to be cleaned. In contrast to the relatively low-stressed floor coatings the job profile of polymer coatings for permanently stressed components is much more complex. Besides permanent high chemical stresses by acids, lyes, saline solutions, organic solvents, varied chemical compounds or water vapour there are effect-reinforcing influences in form of raised temperatures, changes in temperature, stresses by pressure or abrasion and permeation procedures. Depending on the corrosive stress there are different kinds of coatings starting with the thin coatings having a layer thickness of max. 1 mm, over the thick coatings having a layer thickness of max. 5 mm, over the multilayered glass-fiber reinforced laminate coatings with a layer thickness of 2 – 6 mm until the synthetic resin screeds with a layer thickness of max. 50 mm. Coatings of Reko Korrosionsschutz GmbH are applied onto steel and concrete substrates in tanks, pipes, reaction towers, gas scrubbers, basins, grooves and sumps as well as on storage, pedestrian and transportation surfaces for example in the chemical-pharmaceutical industry. For the application of water-endangering liquids many coating systems which are approved by the DIBT are available. As certified professional company acc. to § 19 I WHG all interests concerning an endangering of the groundwater can be considered. In tanks and ducts we often use spray-applied coatings on the basis of vinyl ester resin which are filled with flaky barrier materials, the so-called flakes. They are based on glass or minerals and during application they arrange in many sandwich layers parallel to the substrate and so increase the permeation resistance crucially. In the food industry mainly modified epoxy resin systems are used which possess the certificate „authentic food“. For the electronic and electrical industry we offer special floor coatings which have a high electrical derivation ability. In exhibition rooms, lobbies and entrance halls we apply our coatings onto floor surfaces which are based on mechanical as well as optical features.